Pizza and refreshments provided! Please direct questions or concerns to Matthew Manley, Flood Recovery Planner. Visit the Dr. BOP Planning page for more information, and check back in regularly for the latest updates throughout the process. 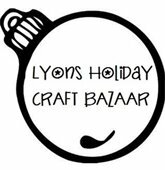 The bright glow of the holidays is once again coming to the Town of Lyons December 3! The Lights in Sandstone Park return to Lyons again, for a colorful and exciting dancing light display, synchronized to music. The light show will be available for public viewing from December 3 through December 31, from 5 to 8 p.m. Kicking off the month-long light show is the annual Holiday Parade of Lights, which will be held on Saturday, December 3. 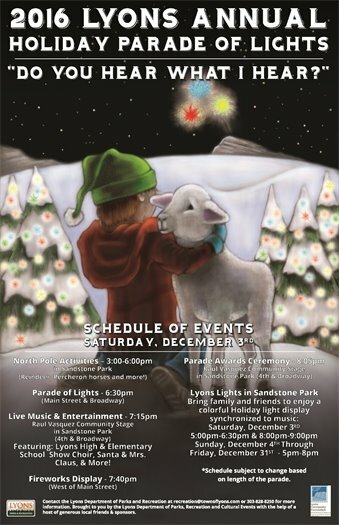 Events begin with a visit from reindeer and Percheron horses, happening in Sandstone Park, from 3 to 6 p.m.! At 6:30 p.m., the parade of illuminated and lively floats will take it's route through town. Many floats will be decorated in the theme of this year’s parade - “Do You Hear What I Hear?” Interested in being a part of the parade? Sign up! Keeping the evening spirited, live music and entertainment will take place in Sandstone Park on the Raul Vasquez Community Stage, following the parade. At 7:40 p.m., the night sky will be bright with fireworks, made possible by donations received from local supporters. The Parade Awards Ceremony will take place at 8:05 p.m. on the Raul Vasquez Community Stage, awarding the outstanding parade entries of 2016. The parade will route through Main Street, Broadway, Old Main Street, High Street, Park Drive, Railroad Avenue, Evans and portions of 2nd & 3rd Avenue, and LaVern Johnson Park. We are asking for your cooperation in assisting Town officials to clear vehicles from the downtown area prior the event. Parking will be available in Bohn Park, the RTD Parking Lot, and side streets on the north end of town. The space on these streets is needed for safe pedestrian passage, parade traffic flow, and staging. Cars will not be permitted to park on these roads between the hours of 4:00 p.m. and 9:00 p.m. on Saturday, December 3, 2016. Vehicles may be towed at owner’s expense if you are parked in a no parking parade route area between these times. Spectators should view the parade from the sidewalk areas and should not be in the street while the parade is in session. Please be aware of your surroundings while the parade is passing and please be sure to keep an eye on all children during the event, should items such as candy be thrown by any parade entries (although strictly against parade rules). Thank you for your support in this matter! 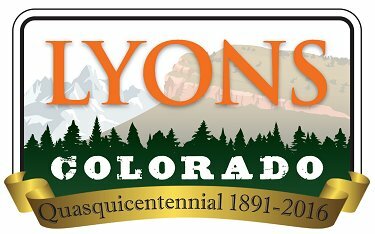 For more information, call Lyons Parks & Recreation at 303-823-8250. The Saint Vrain Creek Coalition and its consulting team, led by S2o Design and Engineering, will be hosting the 3rd public meeting for the Creek Rehabilitation Plan for Apple Valley Project. The team has been working hard to develop a draft 15% design plan that will show the best stream design for the project area based on the analysis of collected data, stakeholder feedback, and funding constraints. Please join the team to learn about the draft design and to provide us with your feedback. For updates on the Creek Rehabilitation Plan for Apple Valley, visit the project webpage. Comments can be submitted to the project team through the online form on the webpage at any time.